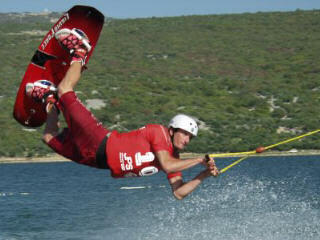 The Krk Water Ski and Wakeboard Ski Lift Center has been successfully operating for six seasons in the Puntar Bay on the island of Krk. The Center, 400 sq m in size, located above the sea, includes the ski lift start area, a bar and a restaurant with a roofed terrace and a sunbathing area on the upper floor, a pro shop and a drugstore. The visitors can also enjoy the beach situated next to the facility. We offer whole-day and half-day ski lift group arrangements as well as wakeboard package holidays. Each group is welcomed by a host who provides the group with all the necessary explanations and helps them prepare and choose the appropriate gear. The ski lift staff, two instructors and the host, will make sure that all visitors get relevant instructions, appropriate gear and learning assistance. If there are more than twenty people, we will organize two groups, so that while one group is learning how to use the wakeboard, the other group can enjoy swimming and bathing in the sun. Lunch is served on the roofed terrace of the restaurant. The deck chairs on the terrace on the upper floor are at the group's disposal while visiting the Center. From 9 a.m. - 1 p.m. OR from 2 p.m. - 6 p.m.